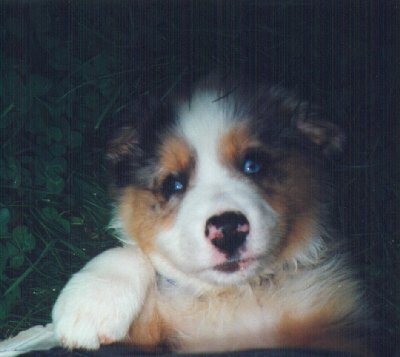 Tucker was born 27 March 1998 at White Column Farm in Centerville, VA. His mother is a black-tri Australian Shepherd, and his father is a blue-merle Aussie. Both his parents are search and rescue dogs, and his father worked for the FBI. We got Tucker on 23 May. Tucker is a blue merle, which means he is basically a black dog, but with the merling gene which makes the areas where he would normally be black actually be a pattern of black and grey. That gene also probably gives him his blue eyes.